Try Continuous Ink System with your Brother MFC-685CW and make 30 times more quality prints for the same money! Pay only 0.04 USD for A-4 full color print! CISS brother mfc-685cw is a continuous ink supply system applied in ink-jet printers. As we can see from the name the task of the system is to provide continuous supply of ink into a printing head of printer while its consuming. And in contrast to cartridges in which the amount of ink is limited by its volume CISS mfc-685cw has external containers for ink of sufficiently larger size (up to 1000 ml). It allows sufficient increasing the amounts of print and above all it gives a possibility to use alternative ink which is sold in packages from 100 to 1000 ml which are much cheaper than original ones. How does CIS brother mfc-685cw work? CISS ink system brother mfc-685cw like its class neighbor-models such as CISS for brother mfc-290c and CISS for brother mfc-255cw consists of cartridges and containers for ink; the amount of containers corresponds to the amount of cartridges. They are connected by thin channels from each container to each cartridge and together they form a loop. Each container is filled with ink for colours. Thus, ink will be enough for a sufficiently long period of time. Those people who have changed cartridges not once will ask a question: вЂњEach cartridge has its programmed chip which counts the volume of remaining ink. That is why even if you fill a cartridge, chip will not allow printing, basing on its data ink ran out long ago. How does CISS for mfc-685cw overtake this technology?вЂќ The case is that such systems of ink supply use automatically clearable chips. When they show that the ink is over it is enough to re-load printer and indices will be again at the highest mark. 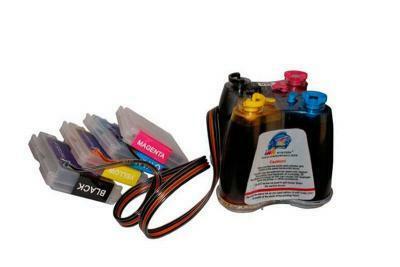 What attracts consumers in such system of continuous ink supply? allows reducing the prime cost of print by factor of 40-50 (depending on the model of printer or MFD) in contrast to using of original cartridges. excludes the necessity of buying cartridges regularly and wasting time (for example, when you need to print something in the evening and printer informs you that вЂњit is necessary to change ink cartridgesвЂќ. for simulation of cartridges change when printer requires вЂњto change ink cartridgesвЂќ it is necessary to press the key вЂњnullingвЂќ which is located on the cartridges block of ink supply system. using ciss for brother mfc-685cw you constantly visually control the level of ink in containers-donors and by its sufficient reduce you just add corresponding ink if necessary. the capacity of each ink colour in the system is 80 g that is much higher than the capacity of ink in original cartridge (7-15 g). using continuous ink supply you get perfect quality of printed photos. CISS for brother mfc-685cw is completed with a detailed guide for its installing on a printing device and full ink set and also with all necessary accessory materials.